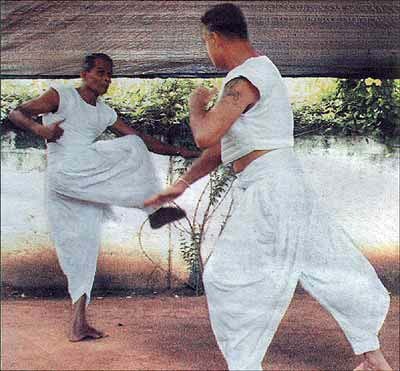 Two Anangpora gurus: Karunapala (left) and Reinzie Wickremasinghe during a sparring session. I watch two elderly gentlemen in a sparring contest. The now famous state­ment "He floats like a butterfly and stings like a bee" made about leg­endary boxer Mohammed Ali in Johnny Wakelins hit single in the 70's 'Black Superman' rings in my head. I continue to watch the two sixty something men, each dressed in a white padded skinny and traditional 'Diya Katchiya', as they size the other up; floating like butterflies. I wait for the sting...it comes...so sudden that it takes me by surprise. One throws a quick punch. The other gracefully avoids it and entangles his adversary's hand in a lock, wraps his other arm around the assailant's neck and wrestles him down to submission. The two men then get up and smile at me. I have just been witness to the oldest and probably the only form of authentic Sri Lankan martial art: Angampora. The two men giving the demonstration are two old hands at the sport. They are master Karunapala, who runs a school for Angampora in Mirihana and Rienzie Wickremasinghe. They both have practised and taught this ancient art for over five decades, and are determined to ensure that it does not die out or is subject to distortion in anyway. 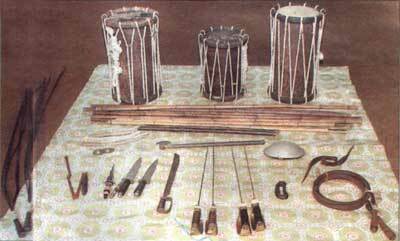 Both also hold the title of 'Panikkirala', the highest grade in Angampora, equivalent to the black belt in karate. Where did this art originate? What are the fundamental principles its practi­tioners follow? What future does it have? With these questions in mind Sports Weekly inquired about the masters and practi­tioners of this ancient and elusive art. The findings amazed us. The exact date of the origin of Angampora is not known. What is known however is that it dates back to the Anuradhapura era to the times of the ancient Sinhala kingdoms. In those days it was the fighting technique of the noblemen. Legend has it that the army that came under the command of Sapumal Kumaraya comprised fighters skilled in this martial art. Angampora continued with the Sinhala kings with the transition of the kingdoms towards the southwest of the country. However, with each new king emerged new gurus and as a result the pedigree of the gurus of Angampora got diluted. The last of the Angampora gurus existed during the Kandyan kingdom. The sport, that had withstood the test of time, faced its biggest challenge during this era. The British, two years after capturing Kandy and gaining control over the entire island, passed a law to ban Angampora in 1817. The penalty for anyone found practising the art was harsh. Those who breached this law were shot below the knee. Many gurus and students gave up the art in fear of punishment. The high status the sport had earned was lost and it was looked upon as the game of criminals and vagabonds. However, a few continued to practise this traditional art in secretive places. It's from the remnants of this art that guru Karunapala passes onto his stu­dents today. After several years of infor­mal training and practice guru Karunapala and Wickramasinghe, with the motive of further developing the sport, established the Jathika Hela Angam Shilpa Kala Sangamaya in 2001, the gov­erning body for Angampora. That same year they applied for registration with the Sports Ministry. The Jathika Hela Angam Shilpa Kala Sangamaya has waited three years for a response from the Sports Ministry. Every practice session begins with a session of meditation and an offering of pin (merit) to their guru. When a student first enters the class he or she has to light three lamps and make a pledge. "I can judge whether a student is mentally fit to learn the art by the manner in which the student makes the pledge. If I sense doubt or scepticism in the mind of the student and feel he or she cannot cope with the discipline I don't take them into the class", says Karunapala who adds that many fail this initial test. Students also have to produce a police report or Grama Sevaka report before gaining entrance to the school. All this is done to ensure that only people with a stable mind and good conduct can follow the training schedule of the art. A variety of weapons are used in Angampora. One of the most lethal weapons is the 'Velayudaya', a whip like apparatus made of four double-edged flexible strips of metal. A practitioner uses a pair of this apparatus to obtain maximum effect. However, only the most experienced fighters use these weapons, as there is a risk of cutting oneself badly while lashing out at an adversary. Then there is the combat sword. This thick instrument is custom made for the fighter. The length of the sword is similar to the distance between the fighter's fingertips and his under arm. A smaller variety of sword, known as the 'Keti Kaduwa', is also used. This is used together with a small shield or 'Paliya', which is about the size of a standard wall clock. A beginner is first taught basic warm up exercises. Later a student is taught more specialized exercises which are connected to the art. Once a student is found competent in performing these specialized exercises he or she progresses to the actual art of combat. The first skill a student learns is the `Mulla Panina' exercise or basic foot movement. This is done to the rhythm of the geta bera drums, a movement that takes the form of a dance. The basic principle behind Mulla Panina is to learn to use one's feet. This will help a practitioner of Angampora to sidestep an attacker and keep one's balance at all times. Once this basic foot movement is mastered a student learns a more advanced foot movement known as 'Gaman Thalawa'. Gaman Thalawa is structured around the movements of big cats. This feline like movement makes the fighter move in a rhythmic semicircular pattern, similar to the moving pattern of an angry tiger in a cage. This foot movement coupled with Ath Haramba or hand movement results in what is known as Amaraya. Amaraya is the use of Gaman Thalawa in a sparring contest against an opponent. The contest between two as mentioned at the beginning of this article was an Amaraya. Here the two opponents move around sizing each other up in rhythmic feline like movements. Then there are the three main hand movements or Harambas. I already mentioned the Ath Haramba, which is the use of one's bare hands in combat. In Ath Haramba the student is taught to take on the attacks of adversaries from four directions. An integral part of this is the knowledge of targeting sensitive points in the body when striking an opponent. So this is the great martial art known as Angampora. The art that should be regarded as a national heritage is unfortunately fighting for recognition in our country. 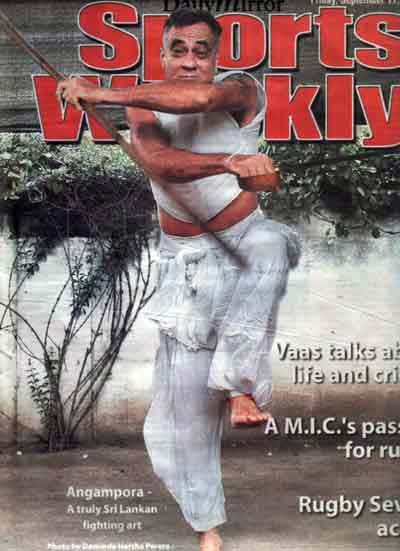 Let's hope that sports authorities give this martial art its rightful place. People like Karunapala and all those involved in promoting Angampora are doing yeoman service to ensure that the art that has survived for over a thousand years doesn't die. We wish them all the best. Angampora classes are conducted daily at the Hela Kreeda Samajaya at No. 6 Kanatta Road, Mirihana. For more details, contact guru Karunapala on +94 11 555-1770. For thousands of years Angampora fighters sacrificed their lives not only to protect the country from foreign invasions but also to protect this form of martial art. "Angampora was revered and considered divine," says Deshamanya Mahanthaarachchige Ajantha Perera, a descendant of the Korathota Aarachchi Angan family. He has studied all forms of the art from the time he was six years old. Believed to have been handed down to the Sinhalese by the Yaksha tribe, Angampora has a history that dates back thousands of years. It was Angampora that gave the people of Lanka the strength to fight the Portuguese in the battle of Mulleriyawa in 1562 under King Seethawaka Rajasinghe, he says. The Ran Kadu Pujawa, an annual event organised to celebrate this victory at Mulleriyawa, and to offer blessings to all soldiers, horses and elephants who sacrificed their lives during this battle will be held for the 449th time at the Ran Kadu Paththini Temple in Kaduwela on August 23, 2011. A performance of the traditional martial art form of Angampora as well as the ancient weaponry used in battles will be on display. Ajantha tells the story of how his forefathers fought alongside King Rajasinghe. In honour of their bravery, the king had handed over his sword and the land of Hewagama Koralaya to their family. The king's sword has been protected by Ajantha's family for centuries. Speaking of the history of Angampora, Ajantha describes how the British rulers, in a desperate attempt to control the rioting people following the Uva-Wellassa uprising, issued a gazette in 1818 banning Angampora, and ordered all Angan Madu (places of training) to be burnt and anyone guilty of practising this art to be shot below the knee. 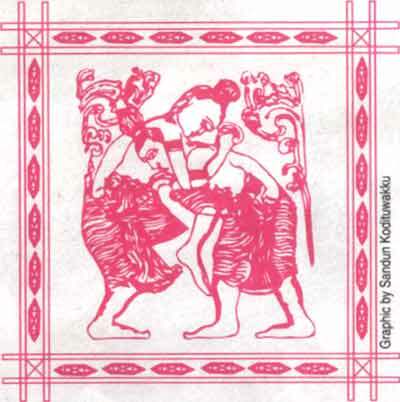 During this time, Angampora went underground and many masters incorporated Angampora moves into dance forms. For many years, Angampora remained hidden from the public eye and today, many Sri Lankans know very little about this traditional art form. "We want to tell the people of this country and the world about the art of Angampora," says Ajantha adding that the event will be of value to those studying dance, history, culture and everyone interested in learning more about Angampora.